In Theaters Now – Caught Mapping, The Movie. Ever wondered what goes into a map? We let the cameras behind the scenes at Maps.com to reveal the intricate and detailed work of our expert draftsmen and scouts. Its truly amazing some of the tricks they use to ensure that maps can be updated almost every 2 weeks! All done unmindful of gruelling road and weather conditions. Vacuum frames, glass negatives and zinc plates – Enjoy this 9 minute vintage movie all about mapping for the modern motorist, keeping pace with the rapid change of America’s roads. 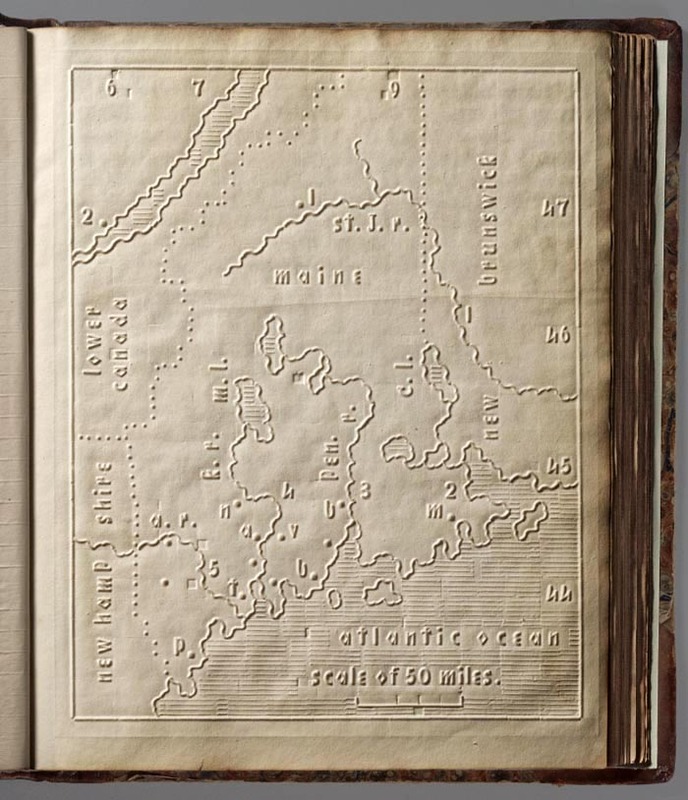 Maps for the Blind: From 1837 to today. Recently a group of Maps.com representatives head to San Diego for the ESRI User Conference. They absorbed a ton of information covering wide and varied topics in the mapping and spatial data arena. One of the main themes of the conference and a recurring one in Cartographic arenas is how we gather, process and present the amazing amounts of data now available via the internet. 3-D terrain data, publicly sourced cartographic data, Landsat imagery and collaborative imagery management are all topics that were discussed and reviewed at the event. When creating maps for the blind, less is truly more. For a product to successfully convey spatial data it must be limited to the most vital information and avoid data ‘clutter’. This most disciplined branch of Cartography has actually been around for over 180 years and is addressed in this recent Strange Maps article. Those with visual impairment and blindness are required to be more spatially aware than most of us as they negotiate the hazards of everyday life, but when it comes to the bigger picture cartography frequently comes up short in trying to deliver ‘the Google Maps’ experience to this audience. In 1837 the New England Institute for the Blind published 50 copies of the ‘Atlas of the United States printed for the use of the Blind’. 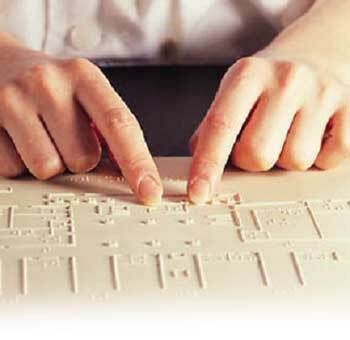 The maps are produced in a Braille-type print that embosses the various lines of the map for touch reading. The text was not produced in Braille (an alphabet consisting of raised dots in various configurations) but in standard Latin characters. The ocean is distinguished by horizontal cross-hatching and the major cities are identified using a key. There are 24 state maps which included numbers for latitude and longitude and illustrations for mountain ranges. 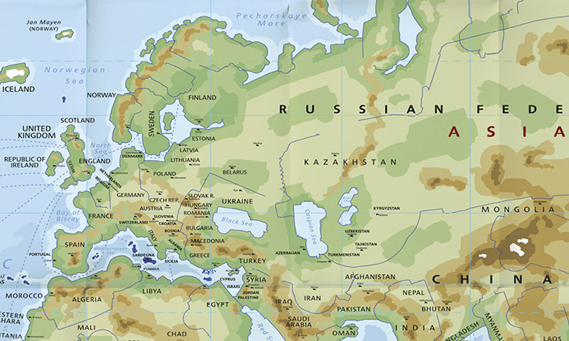 Each map is accompanied by a descriptive piece outlining points of note about the region covered, again using Latin characters as opposed to Braille. Despite being a pioneering innovation, with such limited circulation it is difficult to regard the atlas as a major commercial success, however parallels can be drawn with some of the innovations in contemporary cartography as we attempt to use our maps to solve very specific problems and address the difficulties of presenting complex data in a user friendly format. This atlas also represents the first instance of touch operated maps – an altogether more common attribute since the advent of the iPad. Jump forward to today and there several approaches to providing mapping for the blind. A German project, The Look and Listen map, is attempting to crowd source data that we naturally absorb and process and adapt to as we walk down the street. For example locating street crossings that have tactile paving and sound or vibration alerts can be a vital part of safely negotiating a busy downtown. In France, researchers have used stereo cameras mounted on glasses to record and render 3D imagesthat are then translated through an electronic tactile device that instantly produces embossed maps similar to the ones Lowe produced, but with greater detail and accuracy. “The ability to wander around and get lost on a map is so much better than getting lost in real life” said Josh Miele, a scientist at the Smith Kettlewell Eye Research Institute, himself blind, in an interview with NPR. The maps they have developed are printed by the Lighthouse for the Blind in San Francisco using an automated version of Lowe’s embossing process, which enable blind people to build up a strong cognitive understanding of an area before they have visited it. The report reveals a change in the attitudes of cognitive scientists who have long believed that blind people could never understand maps because they are visual representations of spatial concepts. While tools such as the Trekker Breeze – a GPS device that gives voice prompts regarding current locations, intersections etc offer a detailed view of immediate surroundings, tactile maps give a much broader relational view of an area. Interestingly the concept of all maps being a ‘spatial’ tool as much as a visual tool is reinforced when one considers the pros and cons of the Breeze-type device versus the Braille print version. Smith Kettlewell have been attempting to bridge the gap with its Audio Tactile maps which include a detailed audio component activated when using a tactile map. They have produced a version for the BART stations in San Francisco including street, concourse and platform maps for each station. Much more of the atlas can be viewed here in the David Rumsey collection. In “A history of the world in 12 Maps” Professory Jerry Brotton demonstrates the bias and distortion behind a variety of cartographic examples stemming back to the first Mercator projections. 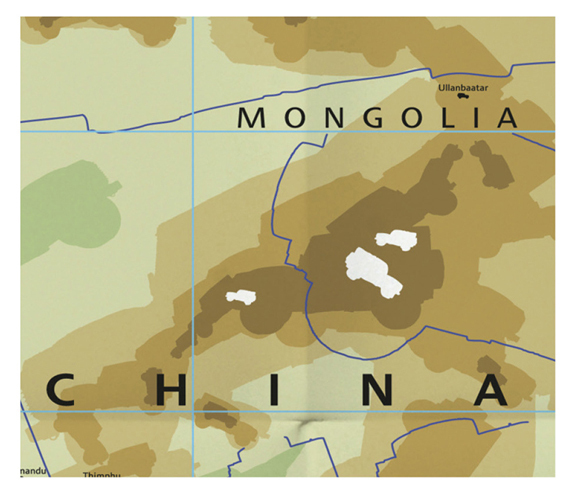 In this interview for the BBC, he shows how maps at their worst can be a deceptive expression of the politics of the author, or simply a reflection of a particular contemporary view of the world. He asks if there should be more concern about a private entity such as Google being the single biggest collector and owner of geographic data worldwide. (Of course some authors would argue that expressing our feelings and beliefs through maps is a freedom we should treasure and celebrate). Help yourself to a Peters or Mercator projections at Maps.com’s online map store. If you didn’t catch the issue as soon as you looked at the map, don’t feel bad. Apparently neither did the author nor The Atlantic. 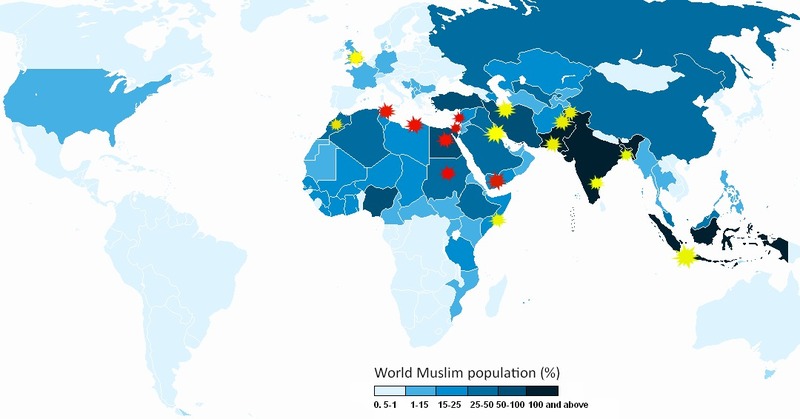 If you look closely, you will see that the map’s legend is labeled incorrectly as the percentage of Muslim population. How can any group have over 100% of the population in a country? Must be that new math they keep talking about. What the map actually shows is the total population of Muslims in each country. By using this map in this way, the author is (consciously or simply in error) showing the center of Muslim World much farther eastward towards South Asia, when it is generally accepted that the ‘Muslim World’ is defined roughly as North Africa and the Middle East – where the faith has the greatest influence and control. A better map to use in this instance is a map of showing the % of Muslim population. While we don’t think that this was a malicious or intentional deceit, it is certainly one that we would put in the category of a Map FAIL. It will be interesting to see if Mr. Fisher corrects the error and if the use of a correct map will change any of his conclusions. For the second time in 2 years China is reeling from massive flooding that has left death and destruction in its wake. Last weekend Beijing, China‘s capital, experienced its biggest rainstorm in 60 years. Rain flooded streets and underpasses, caused buildings to collapse and led to 37 confirmed fatalities. Many residents were critical of the preparations and handling by the Chinese authorities, who announced in 2010 the development of a flood risk map to identify those regions most at risk. The city has been modernized so quickly – with much of the most recent focus around the 2008 Olympic Games – critics are suggesting that essential infrastructure improvements including drainage have not kept pace. In defense, Ministry of Transport Engineers argue that no city could cope with what equates to six months’ average rainfall in a single day. Most embarrassing for the Chinese authorities was the closure of Beijings airport – stranding tens of thousands and preventing hundreds of flights from coming in or out. China relies heavily on international business visitors as it continues its global expansion of trade. One silver lining from the catastrophic events in Beijing was the performance of the Three Gorges Dam, which this week began using the final 32 of its hydroelectric generators making it the world’s biggest power plant of this type. The dam appears to have come through the flood peak unscathed and protected areas in the lower Yangtze river from further damage. The plant can now provide the equivalent output of 15 nuclear reactors to the increasingly energy-hungry nation. What isn’t known is whether massive amounts of trash, which clogged the dam after last year’s rains will return to cause further problems. 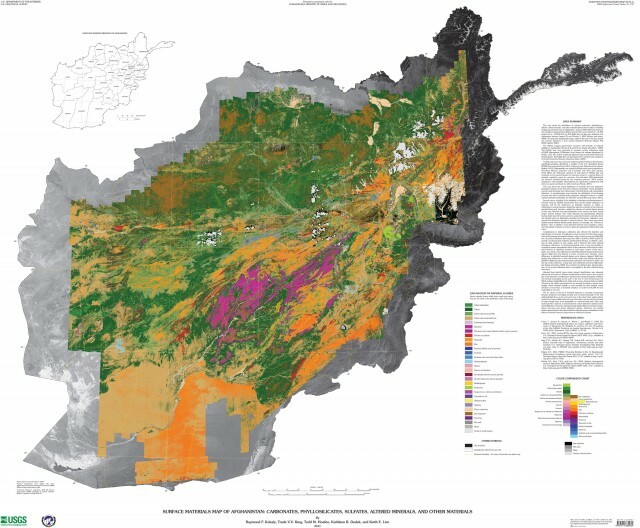 The USGS has used hyperspectral imaging data to map out Afghanistan’s mineral resources. More than 200 flight paths at 50,000 feet were used to measure surface reflectance covering over 70% the country. The results were then analyzed to determine which minerals, among other surface materials, were represented. The various levels (across 800 million pixels of data) were plotted for each flight in a data layer over Landsat satellite imagery. Because the accuracy of the process can be adversely affected by the occurrence of airborne dust, cloud cover and surface moisture, in some areas the map is cross hatched, for example, to indicate possible discrepancies in the data. These inaccuracies do not affect the viability of the process however, given the huge surface areas that can be covered much more practically than with any other process. The results also show the locations of vegetation, water, ice and snow cover. No news on when a new version of Google maps is due out with ‘mineral deposits view’ as a switchable layer.